The 2014 GII - global innovation index ranking, published by INSEAD and WIPO, brings comfort to the idea that HI (high income) economies are more adept to rank higher in innovation than lower income ones. 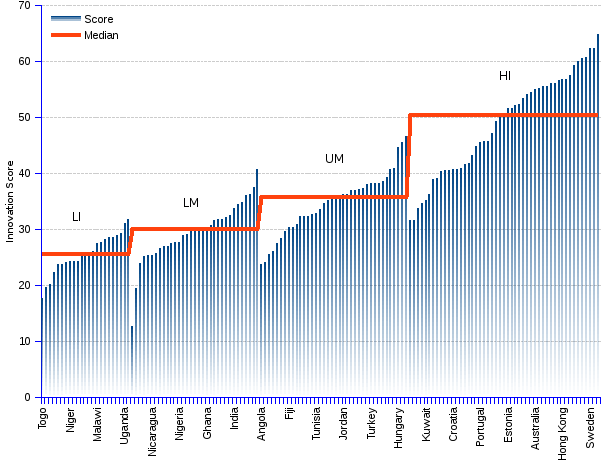 In the top 50 ranked countries, 43 or 86% are HI economies, only 6 or 12% are UM (upper-middle income), and 1 or 2% is LM (lower-middle income) — as the popular saying goes, "money buys money". Eight small countries appear among the top ranked ten nations, with Switzerland at the topmost rank. The two heavyweights that manage to sneak among them are the United Kingdom, number 2, and the United States, number 6. In short, the 2014 ranking offers more of the same: a shining performance by a bunch of smaller, developed economies. The chart is structured by income group affiliation, showing by a red line the median GII for each of the four income groups. It becomes obvious that innovation is more likely to be higher in wealthy economies (HI group) than in poor ones (LI group).The median value for each group goes up by increasingly large discrete steps, as the set transitions from one given income group to the next higher income group. The innovation index seems to corroborate other data pertaining to science and technology prestigious awards and to world-class universities, suggesting that small developed economies such as Switzerland, Finland or Singapore can outrun the biggies in terms of innovation and efficiency. Innovation, along with other social factors such as public health, education or quality of life, is ruled not by distributive justice, but by positive feedback — the higher the development level, the more likely to be highly innovative. Poorer countries will have a hard time to catch up with the already wealthier ones, and, other things remaining the same, the gaps are more likely to widen than the contrary. The much emphasized "economies of scale", allegedly capable of providing large economies with intrinsic efficiency and cost advantages, are nothing but a mirage, distracting from the true drivers of prosperity and quality of life. Being big and heavy may be useful if the goal is to cause harm, as in a fist fight — a graphic illustration is provided by the current state of African, Middle Eastern or Central Asian affairs, where the western powers have poured their military might to try and crush mushrooming rebellions. The case is altogether distinct if the goal is to build progress, well-being and quality of life for the people. As the GII suggests, elephantine size does not make anyone smarter. It is ludicrous that the EU (European Union), self-satisfied with its own plumpness, could ever dream of becoming "the most competitive and dynamic knowledge-based economy in the world capable of sustainable economic growth with more and better jobs and greater social cohesion" by 2010. This so-called 2000 Lisbon Strategy, highly publicized before the 2008 world crisis, has been kept strictly hush-hush thereafter. EU leaders have good reasons to feel discomfited. In 2015, while EU keeps struggling for survival, the neighboring and small Switzerland achieves a much enviable performance for its people, its economy and its innovativeness. ¹ For previous years, see Innovation Score Lists. However, rankings are not fully comparable across different years, because the number of countries covered by the survey varies. ² GII (Global Innovation Index) (0-100) rests upon two sub-indices, the Innovation Input Sub-Index and the Innovation Output Sub-Index, each built around several pillars. The overall GII is the simple average of the Input and Output Sub-Indices. ³ World Bank Income Group Classification : LI = low income; LM = lower-middle income; UM = upper-middle income; and HI = high income. ⁴ United Nations Classification: EUR = Europe; NAC = Northern America; LCN = Latin America and the Caribbean; CSA = Central and Southern Asia; SEAO = South East Asia and Oceania; NAWA = Northern Africa and Western Asia; SSF = Sub-Saharan Africa. Source: INSEAD - WIPO, The Global Innovation Index.